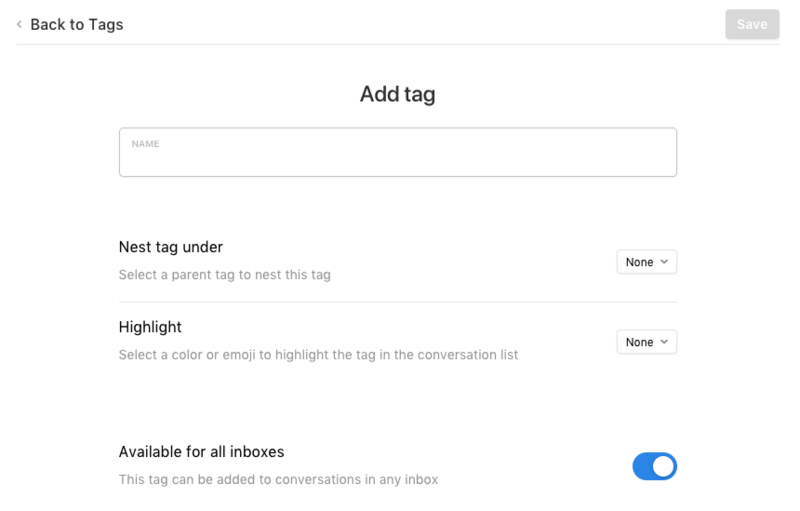 Tags make it easy to track certain topics in your inboxes, set up rules to sort messages automatically, report on trends in analytics, and use as private folders to file your messages into. Private tags will always appear with a lock icon to distinguish them. When you add a private tag to a team conversation, it’s still only visible to you. Also, all your private conversations will have the tag Inbox on them by default, which makes possible the ability to drag-and-drop conversations out of your Inbox and file into a private tag. When you apply a team tag to a team conversation, it will be visible to everyone with access to it. Applying a team tag to a private conversation in your inbox will not share it with your team automatically. When you connect a Gmail or Office 365 account as a channel in Front, your labels (Gmail) and folders (Office 365) will sync to Front as tags, including any nesting you’ve set up. If you connect an account as a private channel, the tags will be private; if you connect an account as a team channel, the tags will be shared with your team. One way to create a new tag is to click the tag icon on any conversation, and select New tag from the list. In the popup window, give your tag a name, select the privacy option, whether the tag should be nested under another tag, and highlight the tag with a color or emoji if you’d like. Highlighting a tag will display it in the conversation list when it’s used on a message. When you're done, click Create. If you create a nested tag, you can see the full tag trail when you apply a subtag. You can nest up to 5 levels of tags. Nested tags can be used for both private and team tags. You can also create tags by clicking your avatar, then into Settings and Tags or My tags. 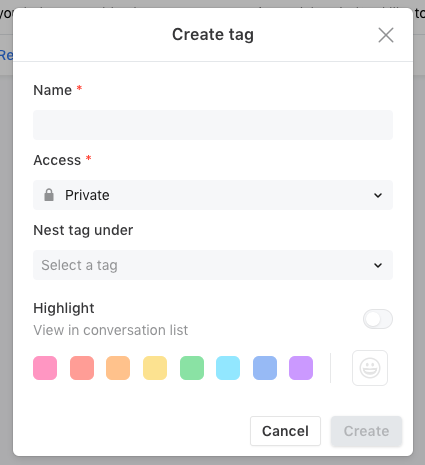 You'll see a blue button to Add a tag, which will allow you to name the tag, nest it if needed, choose highlighting, and choose which inboxes it should be available for. You can highlight tags with colors or emojis to make them visible in your inbox conversation list. This helps you visually identify what’s urgent or understand the topic before reading a message. You can set a color or emoji when you first create the tag, as well as edit it afterwards by clicking the applied tag and selecting Edit. You can use either a highlight color or an emoji. The highlight will also be displayed if you pin a highlighted tag in your workspace. You can tag a conversation by clicking the tag icon. You can type the tag name you want to add in the search bar, create a new tag, or scroll through all tags. You can add as many tags as you want, though Front will collapse the tags when there are many tags on a conversation. You can also automatically add tags using rules. To do this, add an action using Add tag. You may also list more than one tag. Rules are also a great way to use tags to trigger actions. For example, you can set up a rule that when a conversation is tagged “🐛Bug”, it’s automatically moved to your “Tech Support” folder and assigned to an engineer. To view and edit all tags, go into your Settings, and select My tags for private tags or Tags for team tags. When you click into the tag, you can edit the name of the tag, update the nesting structure, highlight the tag, define in which inboxes the tag appears, or delete the tag. Read here for more details about using tags as private folders! The tag path will be displayed in any tag dropdown menu, however, the tag path will not display in the analytics dashboard itself. Am I right that one can only add tags to his own or company inboxes? Is there a way to have company-wide tags and to import them instead of adding them manualy? 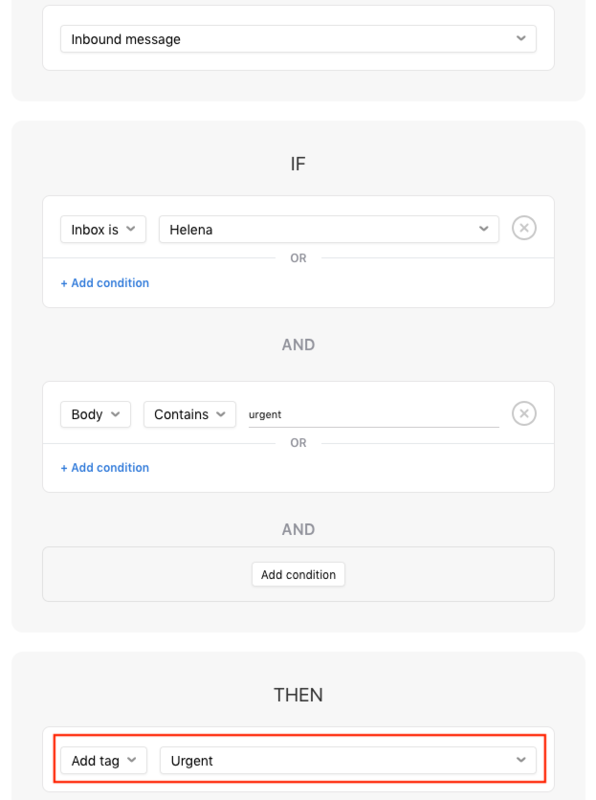 We think of using tags as "folders" and for the time being to achieve that, each user would need to add manually the same tags, to be able to use it in his own inbox. It seems a bit awkward for us. Yes, you are correct. We don't currently have a way to add default private tags for everyone. At the moment tags are by inbox. We are working on revamping tags, and when we're finished, they will be either by teammate (visible only by this teammate), or by team (visible only by this team). We'll be sure to let you know when the revamp is live. Hope that helps! Can I vote for that and see the progress on Front Product Roadmap at Trello Board? Sure, although, there's no need to vote for it because it's already in progress. It's now on Trello. Hey, the settings for new a tag have changed a but right? Right now in our case the tags are set to private by default, is there any way we can set the as public by default when creating a new tag? There's no way to change the default. If you're in a team inbox, it will default to public tags, and if you're in an individual inbox, it will default to private tags. Is there any way to prevent teammates from deleting tags? Or adding tags officially until it is approved? Today we launched the ability to create custom roles and permissions. Take a look and let me know if you have any additional questions! Cori Morris Cori - I don't want to take away the ability from the team specifically but would like some control to be able to modify the tags after they have been created. Example. We have two tags that are meant to be the same thing "Indianapolis (INDY)" and "downtown_Indy" now we have some conversations tagged one and note the other or vice versa... I'd like to consolidate those... is there any easy way we can get that done? I'd like to turn all the "Indianapolis (INDY)" into "downtown_Indy"
Allie Huang Currently there's no way to migrate all conversations from one tag to another. It will have to be manually at this time. Sorry! Cori Morris is it possible to change the highlight color of exciting tags? I can only select a highlight color when I create a new tag in the menu bar via "More" > "Create new tag". If I create a tag via "Settings" > "My Tags" or "Company Tags" it doesn't give the option to select a color either. Rolf Dröge Yes, you can change the highlight color for existing tags. You'll have to do this in the front-end, though. Click the + to add the tag and once it's applied to the conversation, click Edit. You'll see you can add a color there. How do tags sync with our email provider (G Suite)? It obviously imports tags initially, but does it create tags from Front to Gmail or vice versa? Is there any way to change a private tag into a public tag? I made some private ones, but we've since had more members added to the team that will need to access these Tags. Hey Matt Campbell sorry for the delayed response, we didn't see your message. Tags made in Front will sync with Gmail! Helena Li Wow, thanks for the prompt response. 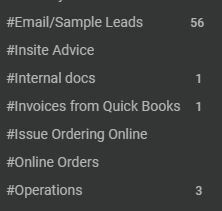 We are trying to figure out why some of our tags are showing numbers, indicating that there are unread or open messages under specific tags. When we click to view the messages with these particular tags, there are no messages in Unassigned or Open. What other reason would there be numbers hanging out next to certain tags? It seems to be happening in private tags. And we have logged into Gmail, to see if we could find some hidden unread messages in the correlating folders, but found nothing. The counter that you're seeing next to a tag includes conversations that have been tagged by all teammates. You may not always have access to those conversations. With this in mind, it's possible that the counter won't equal the number of conversations that you show in that section. Now that there are nested tags.... it'd be awesome if we had an easier to manage existing ones and rearrange them.... we actually have so many "series" of tags. And I have to click on each one to see if I have attached them . Also it'd be awesome to be able to "archive" tags since we can treat them as "campaign labels"
Allie Huang In your settings, you can access each tag and manage its parent-child hierarchy. I'm not too clear on what you mean by 'archive' tags. You can delete a tag from your settings if you no longer need to reference those conversations topically. Additionally, you can also manage which tags are pinned/unpinned via the three bar menu to the right of your individual workspace (to the right of 'Me'). Thanks for the reply Andersen Yu I know you can go into each tag and manage it's parent, but you can't then go into the parent and see it's children.